We are the Rare Earth Vibration Association and we believe in the healing power of the arts: that each genuine voice brings us closer to peace. We all have our own unique vibration and when we create, be it through music, visual arts, poetry, or other arts, we are able to inspire others to seek and voice their genuine selves. Together, we create a beautiful web of uniqueness. This diversity is strength. At REVA, we facilitate the spread of creativity through education, public programs and consulting services. Often, access to the arts is limited by economic and systemic barriers that we are committed to addressing in our education programs. A society is stronger if all the gifts of its citizens are able to be nurtured to fruition. We strive to make these pathways real. REVA brings art to the people. Creativity is an approach, an openness that gives rise to new ideas. We provide musicians & programs, we advise and consult, we collaborate with and help others using arts to build connection and meaning. We have a variety of creative programs, including a Free Jazz kids band, the Young Music Mentor Program, public arts projects, and partnerships with other arts organizations. Click below for more information about our current programs. We facilitate and sponsor innovative and eclectic performance programs, from original poetry opera, Jazz Kids sing alongs, and chamber music to evenings with Master Musicians. To learn about our current performance projects please click below. Tenor saxophonist/pianist/composer Jessica Jones is an innovative jazz educator and consultant, working with children on improvisation, composition, and oral traditions for Jazz at Lincoln Center, Jazz Camp for Female Instrumentalists (Pretoria, South Africa), Stanford Jazz Workshop, Brooklyn Friends School, and others. She has played with Joseph Jarman, Cecil Taylor, and Don Cherry. The primary outlet for her compositions for the past 20 years has been the Jessica Jones Quartet, a pianoless quartet which has several recordings out and has played many US festivals. 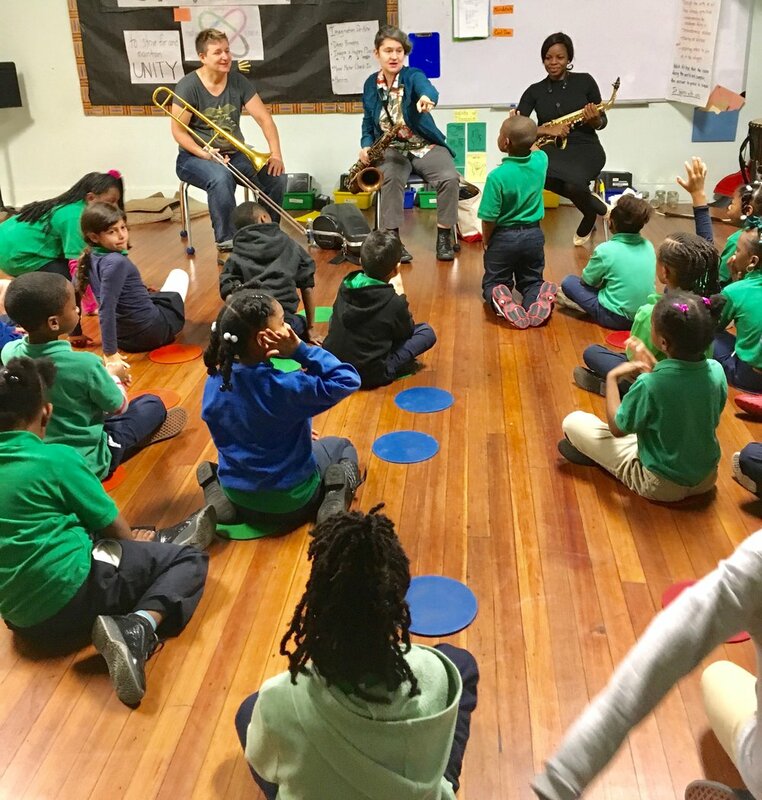 Ms. Jones' zeal for creating accessible music programs for youth led to her partnering with various organizations to found and direct music programs. These include a sleep-away jazz camp for kids, where all music is learned by ear, facilitated by the City of Oakland Cultural Arts Department; a songwriting program for incarcerated girls, facilitated by the National Council on Crime and Delinquency; “Jam Camp West,” a youth offshoot of the successful “Jazz Camp West,” Jazz at Lincoln Center’s JazzGirls Day; and the Visionary Youth Orchestra facilitated by the Vision Festival’s ‘Arts for Art’ organization among others. Through REVA, a wider constituency can be reached, and more programs can be launched to further access to arts education. Saxophonist, composer and artisan woodworker Tony Jones has spent decades honing his parallel crafts, working alongside master musicians and master cabinetmakers alike. Growing up in a family deeply rooted in jazz, he brings this aesthetic to his creations. Recent works include "Pitch, Rhythm and Consciousness," an LP released on New Artists Records. Candace Tortolani is an operations executive with a background in performing arts. Her experience over the past twelve years first as a performance artist, followed by her work with two disruptive start-up companies has given her a robust voice, a gift for public speaking and crafting media initiatives. She has led successful campaigns both in the for-profit and charity sectors. She is an officer on the board of the BCT foundation and now lends her talents to REVA in the areas of media and digital initiatives.